Right now, the city is alive with Tapas! 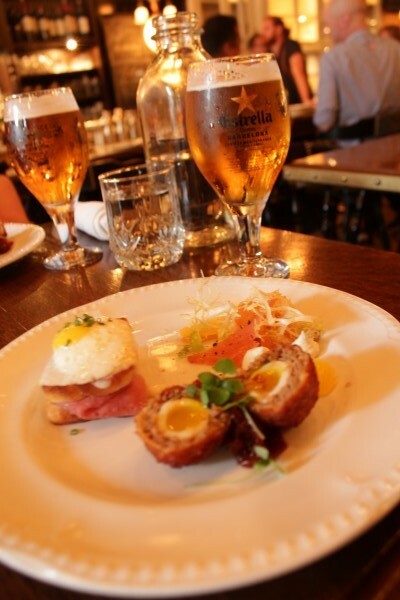 20 of Toronto’s most popular restaurants are taking part in the Tapas Journey sponsored by Estrella Damm beer. Along with a serving of the Barcelona-based brewery’s finest, you can enjoy three tasty Tapas Bites created by some of the most creative chefs in the city – all for $20. Only on until August 23rd – so get out and enjoy this fun promotion while you can! We had the chance to sit down at Weslodge and enjoy their Tapas on offer – have a look! I started by tasting the scotch egg, which I’ve actually had from Weslodge previously and it lived up to its reputation. It was served with a home-made “tomato jam” and while I couldn’t taste it as such, the smell of truffle was obvious. 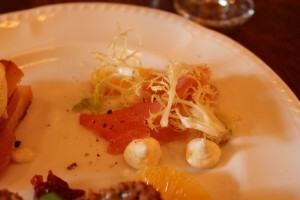 The Trout Crudo was my least favourite of the 3, but by no means was un-delicious. It was described in the Tapas Passport as “Local Rainbow Trout, Maple Vinaigrette, Black Pepper, Creme Fraiche and Frisee” – however the maple was entirely missing from the flavour – however the dish was instead quite Citrusy, and light. 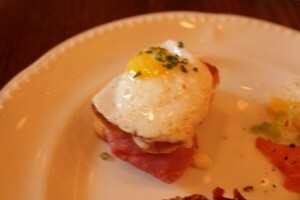 The winner, of the three, however was the Wagyu Croque Madame. I could have eaten ten of these, easily. The Brioche was perfectly spongy without being dry, and the Wagyu Bologna suited perfectly with the Mornay and Egg atop. Savory and perfect – a large sized version would make for a perfect brunch. 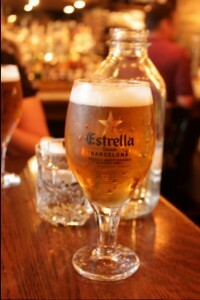 You can enjoy the Estrella Damm Tapas Journey at 20 of Toronto’s Best Restaurant until August 23rd, see the full list of participating restaurants and more info here. The celebration concludes with a fantastic tapas tasting event at Royal Bank Plaza on Sunday, tickets for Pintxos Toronto are still on sale!